From matcha to tinctures, CBD has become as synonymous with trendy, current pop culture as Instagram. The two share more than several traits as well, both offering portals into our contemporary infatuation and desire to achieve holistic wellness. Understanding the reasons behind CBD’s popularity—and the larger physical/mental health movement as a whole—can help all wellness retailers consider how best to market their goods and optimize the customer experience. 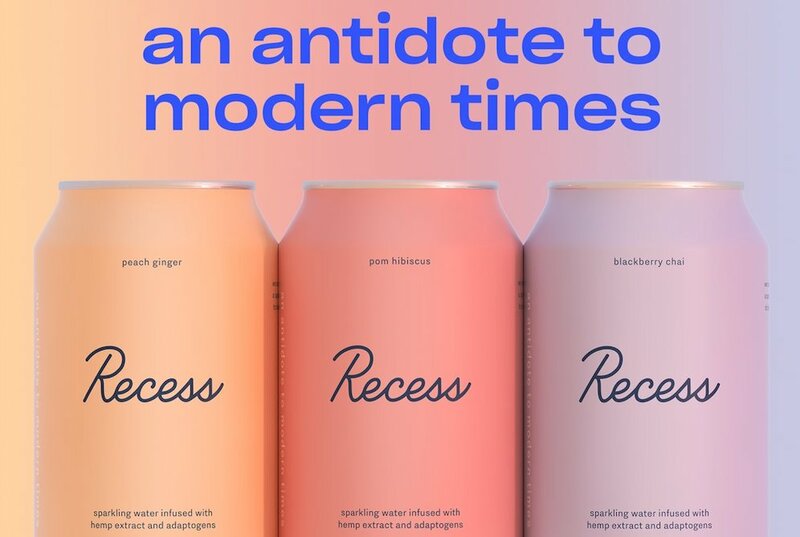 PSFK sat down with Benjamin Witte, Founder & CEO of Recess, a line of CBD and hemp-infused sparkling water intended to curb anxiety and aid productivity. As Recess transitions from primarily online-based commerce to in-store, Benjamin provides key insights for any brand looking to tap into this wellness niche or expand their retail footprint. PSFK: You don’t use the term CBD in your branding. Can you explain why that is? Benjamin Witte: Basically, CBD and hemp products have been operating in a regulatory gray area for a while, up until the end of last year. Right before the holidays, a piece of legislation passed called the Hemp Farming Act, which clarifies a lot of the regulation. It basically separates hemp from marijuana in terms of how they’re regulated and paves the way for hemp extract and CBD to be everyday food ingredients. That said, this bill just passed. There’s also a distinction between CBD isolate and full‑spectrum hemp extract, which is what we use. Full‑spectrum hemp extract includes CBD as well as other terpenes around the compound, which work together to be more effective. We include 10 milligrams of CBD in each can. What motivated you to start Recess? Were there particular trends or consumer demands you were responding to? I’ve always been a naturally wired, hyper, anxious person. When I started using CBD regularly, at that time in oil form, I felt much more balanced and even‑keeled. As a result, I was more productive, more creative and less stressed out. It was clear to me that I wasn’t the only one who felt this way—overwhelmed by modern‑day society, whether from politics, technology, the jobs, the economy, and searching for solutions to take back control, whether through medication, yoga, or cannabis. I concluded that CBD was helping me feel better. I realized this ingredient, this compound, was going to become extremely widespread. It was going to basically be like caffeine or protein, something to just put in everything. At that time, the current applications—oils, tinctures, gummies, vaporizers—were not it. Things you’d buy in a dispensary aren’t necessarily very mainstream. So the big opportunity was beverages. Twenty years ago, people just drank stuff because it tasted good: soda, fruit juice, water. Then energy drinks emerged. Today, you have all sorts of categories of functional beverages, whether it’s protein drinks, kombucha for your gut, green juices, etc. It didn’t make sense to me that a drink category didn’t exist to help people reset and rebalance so they can be their most productive and creative selves. That’s what really inspired Recess. That’s what I designed the brand and the formula around. I view the company like a productivity company. In many ways, I thought that the market was getting the positioning of the ingredient wrong. Subtlety plays to my favor in that we’re really focused on helping people feel balanced, not relaxed. You’ll never see us use the word relaxed, for example, because I believe “relaxed” has a negative connotation. You don’t aspire to relax. If you tell someone to relax, it’s kind of an insult. What the functional ingredients, the CBD and the adaptogens, are designed to do is to help you feel centered and an equilibrium so you can be in more of a flow state. I think that’s a universal idea, just like energy was. I think CBD is blowing up because that’s what people are looking for. They just haven’t been able to describe it. I think why Recess is working is that we don’t even talk about the ingredient. We talk about the solution. We are marketing Recess, the idea of Recess. Everyone else is way too invested in the term CBD, if you’re asking my opinion. Can you give an overview of your current product lineup and where you’re selling it? Our first product line is a line of sparkling water. We have three flavors: blackberry chai, peach ginger and pomegranate hibiscus. Our ultimate distribution strategy is to be sold literally everywhere it would make sense for it to be available. We’ve launched just off our website. We’re doing sales off our website and recently started rolling out in New York City, which we will be ramping up as our first market. Then we’ll be expanding into a number of new markets in the spring. Could you describe the approach you take with branding and overall retail strategy? I really believe in the idea of marketing the solution, not the ingredients. An inspiration was Red Bull. Red Bull marketed, “Red Bull gives you wings.” It wasn’t like, “Here’s 50 grams of taurine and 100 grams of caffeine.” It’s all about the effect and how you’re going to feel. I don’t come from CPG, but the more time I started spending in the space, I was extremely underwhelmed by the brands and the marketing. 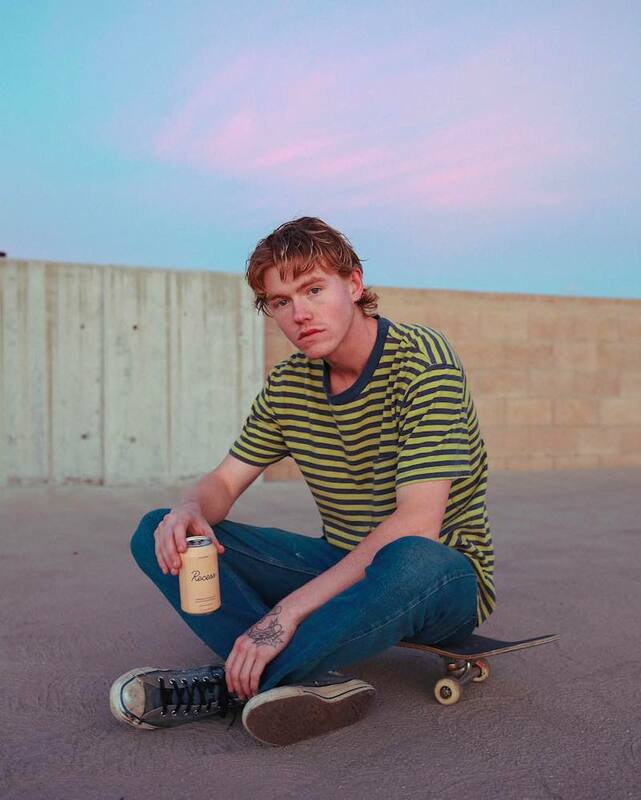 In my opinion, La Croix is not really a brand. It doesn’t stand for anything. I tried to take more of a lifestyle brand approach where we’re marketing this state of mind, this way of life. If you think about the best brands today, in my opinion, they’re some things like Away, which sells a suitcase and marketing a globetrotter lifestyle. Or Glossier, which is selling makeup, but really marketing it as a form of inner beauty and confidence. With Casper, you’re selling a mattress, but it’s really a sleep company. The truth is that when consumers drink a functional beverage or supplement, the perceived effect is a combination of the actual efficacy of the functional ingredient and how they interact with the product, as well as their expectation about what it is going to do to them—which implicates marketing. Have you found that there’s some hesitation from consumers, or are they pretty open to it? No, it’s much more open than I ever expected. Interestingly, a vast majority of our sales come from the Midwest, outside of California and New York even. I think CBD is much more widely accepted than people realize. More importantly, the idea of Recess is resonating in a big way. Again, it’s not about the CBD. It’s about this notion of helping people take a recess in their day, which we all want. Looking forward five or 10 years, what challenges can you perceive? Are they different from challenges that other beverage companies face? My biggest challenge right now is I can’t make enough to meet the demand. It’s better than the opposite problem, but it’s still a problem. A big focus is scaling our supply chain. It will be competitive. In my opinion, my biggest competition doesn’t exist yet. In many ways, I don’t really think I’m competing with other CBD beverages, but more with standard beverages. If you’re drinking Recess, you’re probably not drinking a La Croix or a Spindrift in many cases. In terms of distribution, what’s your selling process like right now? The most powerful thing about Recess is the frequency of use. People who drink La Croix drink it at work. They drink it at home. They drink it everywhere, like during lunch when they’re out at a restaurant. The same with Diet Coke, for example. Those companies were built in a different era of omnichannel commerce, e‑commerce and off‑line retail. When we launched, I wanted people’s first interaction with my brand to be the website and my Instagram because that’s what transmits the emotion of Recess and really tells the story. So that’s what we did. We launched online. After about six weeks, we started rolling out in New York City on the shelf. The versatility of Recess is unique. It’s something that you can drink when you wake up, before you go to bed, and everywhere in between. It’s something that makes sense to buy to be delivered to your home or buy at a restaurant. Our distribution strategy is to meet customers where they are. That’s our plan. Do you have any plans right now to establish more physical presence? We have our first retail experience in the works right now that’s opening up in February. 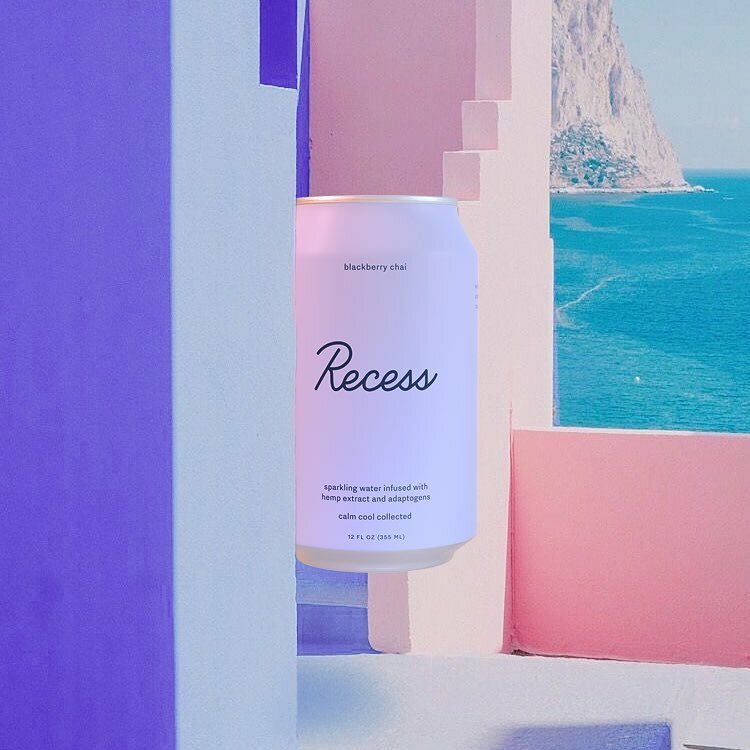 It’s called Recess IRL, In Real Life, and it’s going to feel like you’re walking into our Instagram. We’re trying to create this Recess world that you can walk into to reset and leave inspired. It’s going to be very design‑driven. You’ll be able to buy Recess there, but that’s not the only point. It’s more of a branded experience to get a sense of what the brand’s all about. A core one is that we think of ourselves as not just a beverage company. I modeled us off of Red Bull, which is creating content and experiences. They have a music label and all sorts of things. That’s where I think Recess is going. It’s about the creative process. It’s about helping people feel balanced and inspired to be their productive and creative selves. That might be something they drink. That might be something they consume on their phone, but I think that both are of equal importance to us. Recess is catering to the needs of modern consumers, offering them not just a product but a lifestyle enhancer. For more from similar inspiring retailers, see PSFK’s reports and newsletters.